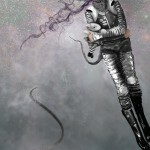 May’s issue of Synchronized Chaos Magazine features a wide variety of creative talent, from free-flowing poetry by David Cicerone and Dave Douglas, to dramatic and highly imaginative children’s book illustrations by Elena Caravela. In this case, Energy in Imagination is intended to denote a vibrant spirit, boldness, and even uncertainty. We are excited to publish the poetry of 2 new SynchChaos contributors: Stephen Labovsky and Jessi Finn. 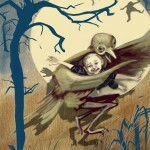 Their work is naturally curious and relatable as they present several descriptive pictures for the reader. Check out the spiritual writing from returning contributor, Blanca E. Jones. Jones was inspired to write this piece after reading bible scripture, Matthew 26:67-68. In tech news, Bart S. Alvara recaps Metaio’s corporate mixer held on March 27, 2011, in San Francisco, CA. Metaio is a growing leader in the fascinating field of visual recognition software. Thank you for reading this month’s issue. Enjoy the last few weeks of spring and have a great Cinco De Mayo, Mother’s Day, and Memorial Day! If the word ‘adorable’ was looked up in the dictionary, it would have a picture of Jack the pirate kitten as a definition. 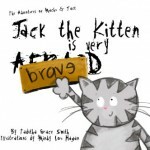 The children’s book, Jack the Kitten is Very Brave, written by Tabitha Smith and illustrated by Mindy Lou Hagan is a winner. 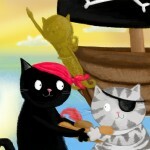 The story begins with a small tabby kitten named Jack who longs to be a brave and fierce pirate. His only problem is his distinct fear of the water. 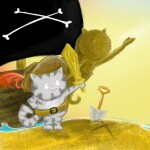 How can Jack be a brave pirate and be scared of the water? His brother Machu loves the water and his brother too and while taking a bath decides to end his brother’s fear. This is a wonderful tale of courage, brotherly love and how to overcome what ever fears you are facing. The illustrations in the book are ‘spot on’. They are detailed and colorful with a childish flair that makes children want to read the story to go along with the pictures. One picture that I found to be cleverly done is a reflection picture in the middle of the story. The reflection in the rippling water is beautiful even from an adult standpoint. The reviewer, J’Rie B. Elliott, may be reached at dixiepoet@gmail.com. Please see the below links to purchase the book. On Thursday March 27th, a bold new vision of the future was being unveiled at the staff offices at Metaio. While music played and drinks were shared visitors to the San Francisco outlet of the independent company were captivated by a new visual recognition software that may change how we view reality. Augmented Reality combines the real and the visual world in real time 3D placing the viewer in the center of an interactive digital world. In non tech-genius speak, a camera is programmed to look only for a certain image, when this image is recognized, a stored illustration is activated and the display reflects that overlapping illustration on screen. Or as the staff at Metaio can state better, “we connect any object to additional, digital information. Our vision is the seamless and easy integration of the virtual into the real world.” Essentially it’s a private green screen, like a movie special effects studio, that can be run from an something as small as a cell phone. While that might be hard to understand, the applications are not. Imagine if your cell phone could simply look at a product and suddenly on screen all the information relating to it popped. 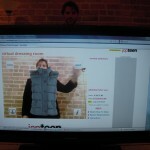 Or your cell phone could display whose trending on twitter or Facebook in your immediate area. This digital interactive advertising was once thought up only in sci-fi movies, yet with the technology provided by Metaio, it may become the standard for the 21st century. You can contact Bart S. Alvara at bartalvara@gmail.com. Click here for Metaio’s Website. 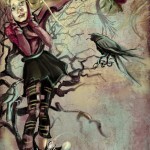 Elena Caravela has worked as an illustrator, instructor, and fine artist. Caravela’s illustrations were featured in award-winning children’s picture books, The Birds of the Harbor and A Night of Tamales and Roses. 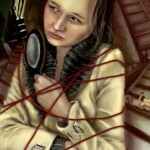 Learn more about the artist and her work at www.elenacaravela.net. They’ve engineered a manhunt for my alter ego!!! David Cicerone is a poet based out of North Carolina. Cicerone may be reached at dpc0729@hotmail.com. Onto a thin sheet of icy candor. Drops a detour of a deadly route. Rides in the bones of the risen Sheriff. I do not dread a curve of sarcasm! Skin is not of concern, but my role. Dave Douglas may be reached at carpevelo@gmail.com. Once we have taken care of life’s essentials—food and shelter—life can be a lot of fun. The day-to-day patterns of life can get comfortable, enjoyable, rewarding in all their small pleasures. Sometimes, however, we must risk losing these comforts. Sometimes, we are pulled to think not just of ourselves, but of our friends, our neighbors, our whole country. And we must rise up out of our familiar, comfortable lives and fight for a greater good. This is the premise of In the Time of the Butterflies, by Julia Alvarez, the novel selected for THE BIG READ in 2011. Based upon a real event in the closing days of Dictator Raphael Trujillo’s regime in the Dominican Republic, this fictionalized version traces the growth and development of the Mirabel sisters, four girls of a middle class, yet rural family, who have a good life. Yet day by day, from their teen years on, friction develops between this good life and their whole country’s life under a brutal dictator: people informing on their neighbors, people being jailed, young women taken for the whims of “El Jefe” Trujillo, people disappearing—never to be seen again! Their good life of planting and harvest and cooking and celebrating ends when their father is suddenly arrested—presumably because Minerva, the most rebellious, the most politically active of the sisters, has refused El Jefe’s advances. The need to fight against Trujillo before he destroys the country spreads through everyone they know like a wildfire. Bruce Roberts is a poet and ongoing contributor to Synchronized Chaos Magazine. Roberts may be reached by at brobe60491@sbcglobal.net.